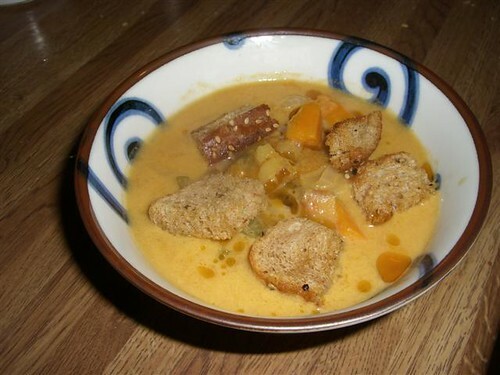 >Recently my lovely friend Deena blogged that she’d made a curried sweet potato soup for dinner and a few days later I found myself making a curried sweet potato soup for my own dinner. After that I asked Deena if she’d write a guest blog to be featured here with the idea that I would post her recipe and my own so we can all see how two home cooks went about the same idea in different ways. There are many ways to cook a sweet potato. You can of course bake them or roast them, steam them, stir fry them (as my friend Baucco loves to). But in my opinion one of the best cooking tricks in the book is microwaved sweet potatoes. Simply stab your sweet potato with a knife a or a fork a few times, wrap it in plastic wrap, and throw it in the microwave for 10 minutes. It’ll be very hot and full of steam when it comes out but the inside will be soft. At this point you can puree it for a sauce or dip or simply scrape it from the peel into asoup pot and it will disintigrate on its own. Hi there, I’m Deena, a friend of Mari’s. When she asked me to write a guest entry for this blog, I was flattered and said yes, of course! My fridge and pantry are often loaded with scraps of food and various ingredients left from other dishes. This time, I had half a bag of sweet potatoes, having used a few of them to make curried sweet potato fries (http://www.glutenfreecookingschool.com/archives/curried-sweet-potato-fries/) as an accompaniment to a previous meal. I wasn’t sure what else to make with the rest of these lovely rust-colored goodies. I’ve made massaman curry before using this recipe (http://www.recipezaar.com/Sweet-Chickpea-Curry-218447) but was looking for a soup this time. The can of coconut milk sat quietly on the shelf, waiting for the right use. (Trader Joe’s sells coconut milk for cheap, so I usually have a can or two); the little jar of Thai red curry paste (this is the kind I happened to have: http://www.worldpantry.com/cgi-bin/ncommerce3/ProductDisplay?prmenbr=1279010&prrfnbr=1351145) has been living in the fridge for a while now. Sweet potato + coconut milk + red curry paste + the chills of a Midwestern winter—I had one of those aha! moments that come to those of us who spend a lot of time in the kitchen. I consider myself a competent cook, even perhaps a good cook; still, I like to look up recipes online to see what kind of flavorings are suggested, what measurements are recommended, and what variations exist. In this case, I searched for “sweet potato soup coconut milk.” I considered this recipe: http://www.care2.com/greenliving/sweet-potato-soup-ginger-coconut.html but decided I didn’t care for the sour cream, lime zest, or green onions; I was also looking for something that used the Thai red curry, rather than the yellow Indian curry that many of us are familiar with. A side note here: if you’ve never played around with the flavor of curry, you should! Curry is a term used to describe various spiced dishes from Asia, particularly south and southeastern Asia. I grew up knowing just enough about some of the meals that are made with masala, or Indian spices. Garam masala is a particular form of spice blend; the words literally mean “hot spice” and the ingredients vary by region in India. There are also many other Asian countries that have spicy, tasty curry meals. In college, I learned about Thai curries, which are also green and red (from the chilies used). Last year, I tried chicken curry while in Trinidad; this dish was a deep yellow color and had its origins in the indentured servants who migrated to the T&T islands in the early nineteenth century. Has that whetted your appetite? This is my brief introduction to the wonders of curry, and I’ve left out most of the other nations that have special curry dishes, but I hope you continue to explore them on your own. Back to my kitchen. 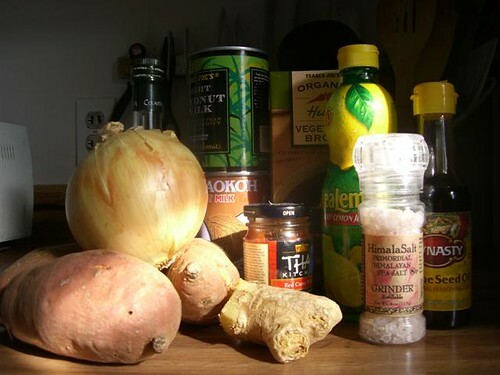 The second result for “sweet potato soup coconut milk” led me to the Post-Punk Kitchen, which started as a public access vegan cooking show with Isa Chandra Moskowitz and Terry Romero. Those two have some great cookbooks; if you haven’t looked at Veganomicon and Vegan with a Vengeance, you’re missing out. PPK’s website also has a great database of recipes. I found this recipe: http://www.theppk.com/recipes/dbrecipes/index.php?RecipeID=212 for “Spicy Sweet Potato & Coconut Soup” and decided it suited my needs. There are two cans of coconut milk there. One is the low-fat version from Trader Joe’s, one is the full-fat version from an Asian grocery store. Either works here; coconut milk is very creamy and rich regardless. Here you can see the ingredients after I’d prepped the onions, celery, garlic, ginger, andwas reconstituting the shitake mushrooms. o need to heat the full-sized oven just for a couple of small things. 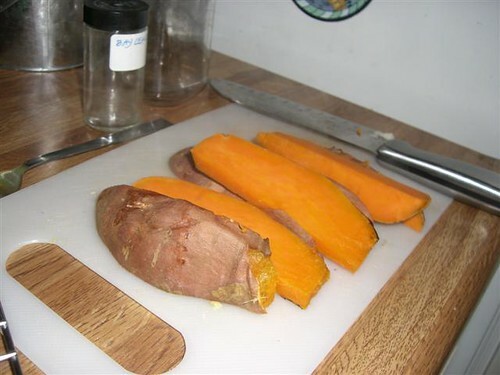 Make sure you puncture the sweet potato a few times so it doesn’t scorch or explode! I left their skins on because I like their flavor, but you may wish to remove them after baking. Just be careful—they’ll be quite hot. oasted some bread and made some quick croutons (http://www.barryfarm.com/How_tos/how_to_croutons.htm). A few days later, I tossed in some leftover saffron rice and made it a heartier meal. 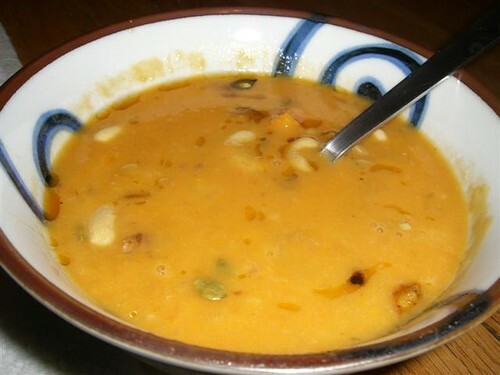 This is a wonderful winter soup, suitable for vegans, vegetarians, and omnivores. Thanks Deena, it looks great! 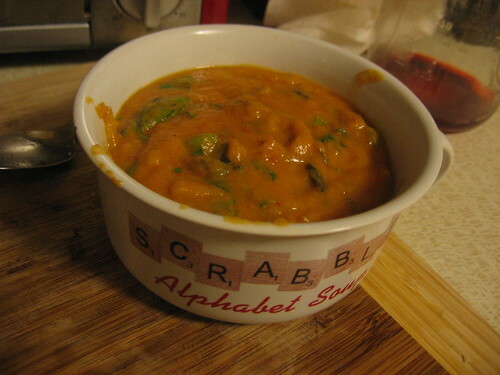 1) Scrape meat of sweet potatoes into a med saucepan. Add all liquids to saucepan (coconut milk, broth, curry paste, soy sauce, rice wine vinegar, liquid sweetner). 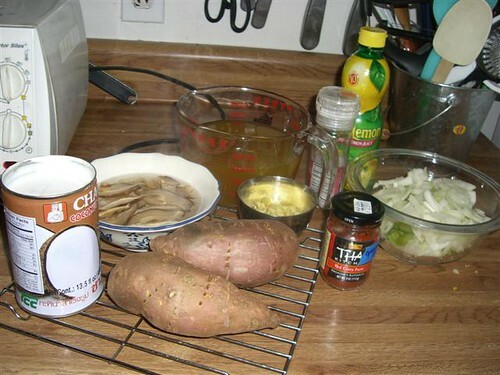 Cook over Med heat until ingredients are completely combined and sweet potato has disintegrated. Season to taste with more coconut milk or curry paste or more soy sauce. 2) Add bamboo shoots, scallion, cilantro. Cook 5min. Note: Thick soups make big bubbles that tend to pop and spray hot liquid into the air and onto your arms. BE CAREFUL!